Bolivian President Evo Morales condemned U.S. interventionism and military bases in the region. August 14 (teleSUR) James Mattis, the United States Secretary of Defense, said Monday that Brazil should lead the “solution” to the Venezuelan crisis as Bolivian President Evo Morales condemned his presence in South America and rejected U.S. military bases in the region. “We condemn the US Secretary of Defense, James ‘Mad Dog’ Mattis’s presence in South America for his country’s interests. The most important interests are those of Latin America and the Caribbean, Zone of Peace that rejects US military bases installed to steal our natural resources,” Evo said via Twitter. Mattis, who heads to U.S. Pentagon, began his first South American tour this Sunday in Brasilia, Brazil. Following U.S. Vice President Mike Pence, who visited the region in June, Mattis focused on U.S. “concerns” over Venezuela’s “difficult” situation. Venezuela is experiencing a deep economic crisis linked to U.S.-sponsored economic sanctions and an overall boycott of the national economy by Venezuelan economic elites. “The U.S. position in this regards is very prudent. 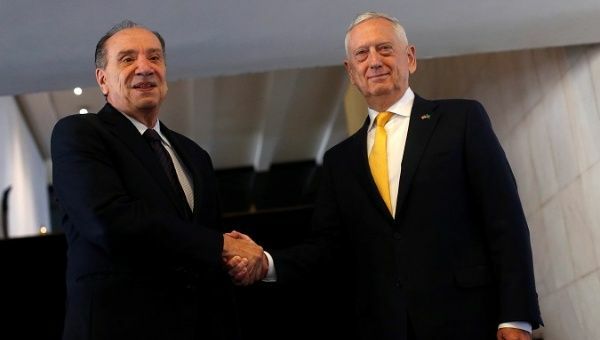 He considers the solution (to the Venezuelan crisis) should be led by Brazil,” Brazilian Defense Minister Joaquin Silva e Luna told the press after a meeting with Mattis and Brazilian Foreign Minister Aloysio Nunes. Brazil has been ruled by un-elected president Michel Temer since 2016 when legislators successfully impeached democratically elected President Dilma Rousseff of the Workers’ Party over bogus corruption charges. Mattis’ comments come after recently elected Venezuelan President Nicolas Maduro suffered a failed assassination attempt, which the Venezuelan government claims was organized and planned in Colombia and Miami. In June, during Pence’s visit, the U.S. highlighted Brazil’s role in the U.S. offensive against Venezuela. “Brazil has led efforts to expel Venezuela from Mercosur, joined the U.S. to suspend Venezuela from the Organization of American States,” Pence said. Mattis also discussed U.S. use of Brazil’s Alcantara missile and rocket launching base. On Tuesday the U.S. secretary of defense will speak at the Escola Superior de Guerra, the country’s college for politics, defense, and strategy. After that, he will fly to Buenos Aires, Argentina, and later to Chile and Colombia, where he will visit defense authorities. The four countries on Mattis’ agenda are currently reliable U.S. allies, they are all members of the so-called Lima Group and are part of the six nations that announced in April their temporary withdrawal from the Union of South American Nations (Unasur), a regional integration body without U.S. presence that proposed the expulsion of all foreign military bases from the region.